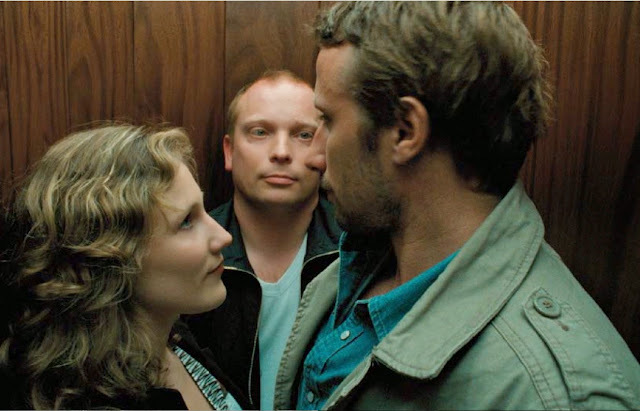 We're venturing into slightly more adventurous territory today in our Mad About Matthias season as we look at 2010 Belgian flick, Pulsar. With the tagline 'Love, paranoia and radio waves' this is a tale that left us is a little confused with its ponderous ambiguity. Narratively there isn't much to grab hold off, whilst it can neither be redeemed aesthetically as it isn't filmed well enough to stand out as a bold visual piece. 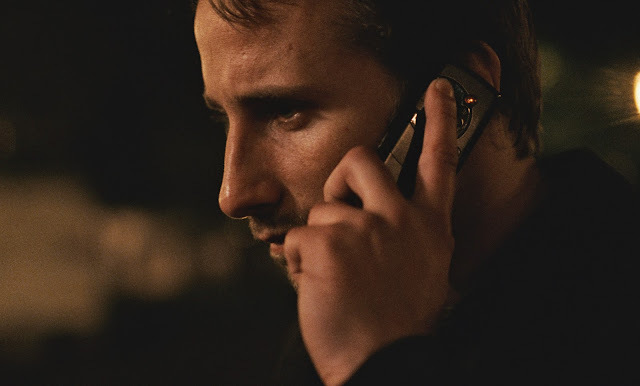 Pharmaceutical delivery man Samuel (Matthias Schoenaerts) communicates with his girlfriend (recent relocated to New York) through online video chat. However, Samuel's computer is hacked and he grows ever more paranoid about this malevolent presence that appears to be observing him. Alex Stockman's film is a real slow-burner that straddles several genres. Part tech-thriller, part long-distance romance, there are also elements of the thriller and mystery film present here. However, the filmmaker fails to fully commit to any of these angles leaving us with a lethargic hodge-podge of the lot. Pulsar gets off to a great start - we see Matthias running in sweatpants, but sadly fails to find its footing from this defining moment onwards. Stockman spends much time exploring Samuel's quiet (already somewhat isolated) day to day life, usually centred around his webchat with girlfriend Mireille (Tine Van den Wyngaert). However when this is affected by a hacker, Samuels gets a slightly off tech guy in to investigate. Sinister undertones begin creeping in but Stockman fails to utilise them with much effect. Samuel has some normal encounters with his neighbours which only fuels his paranoia as his tech problems continue. He soon begins to close himself off from the world - losing his job and installing mesh blackout curtains over his windows and door frames. This is as about as drastic as Samuel's reclusiveness gets and there is the sense that Pulsar could have been a little more dramatic and hard-hitting in this exchange. We know very little about Samuel other than his daily routine so it is a struggle to fully connect with his transition. There's an atmospheric ambience in the film's score which emphasises the pulsing radio waves that Samuel appears to be plagued by, but the use of dated technology hampers the narrative effect somewhat. There is something slightly too low-key and ponderous about Pulsar - it's never quite clear what we've to gain from this experience, other than observing a man's slightly increasing paranoia. It all feels too light and insubstantial. In the final moments, Pulsar makes more of a bold leap to the surreal and the arrival of a strange pyramid like device (a la Silent Hill) rears its head into the narrative. As much as it's refreshing to see Stockman attempt to do something more left-field, this is simply dumped into the narrative with little explanation or consequence. There isn't much to enjoy or admire in Pulsar, it's not an entirely dull watch but more of a frustrating one that fails to commit to any of the intrigue or mystery in its premise. We'll return next week with Bullhead and De Bende van Oss.